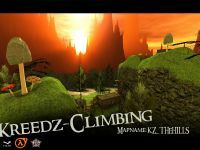 Kreedz Climbing is a unique, non-violent, puzzle-type, 3D-First Person View game where the player attempts jumping and 17 other disciplines like shooting flare targets, racing vehicles, surfing, bungee, bunnyhop, longjump, or sliderace until he/she reaches the top (or end) of any given environment. 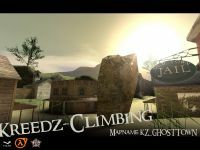 In Kreedz Climbing no map is the same and can vary with any combination of these skills. It's a race against time and against other players with any discipline in the game. Mirrors for the 4.2 patch release news, click this news! Merry Christmas from the ObsessionSoft team at www.kzmod.com! Hey guys, it's actually done. KZmod Beta4.2 is ready to play and brings so much extra fun to everyone who is ready to try it (in case you don't know it already). This is the ObsessionSoft holiday gift to all of you so, Merry Christmas everyone! Remember, KZmod is a Half-Life2 Mod (Full conversion mod) for the source engine. It covers climbing, bhop maps (sv_bhop "1" aka AXN and bhop maps with sv_bhop 0), longjumping, laddermaps, raceways, slidemaps, surfing, bungee maps and much more. Recent additions include: 1.6 doubleducking, 1.6 standup physics, 1.6 ladder engine, a HUGE load of EASY maps for beginners, 300+ map fixes, 5 new Awards, 2 new gameplay modes and much more other important bugfixes (no more lags if the server is full) that make this update feel like the final version almost. Full infos, screens and videos about the mod can be found at moddb.com! -> Note: You need any of the Source Engine games containing SourceSDK BASE to be able to play it, such as Half-Life 2, HL2DM or CSS. You can see a full list of 19 such games or packs here. It is important to realize that to install the full game PROPERLY, you must install 4.0 completely, and then ONLY add the 4.2 Patch update. It contains the 4.1 update so now there are STILL only 2 files to download. DO NOT save your 4.0 config.cfg. Start fresh to ensure you have all FEATURES! -> Note: Those who have premium accounts on rapidshare or ul.to please use these mirrors and help to release a bit pressure from the XJ mirror. 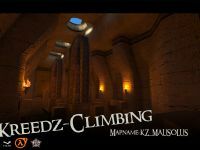 P.S: Please do the mod a big favor and click this, scroll down, and choose Kreedz Climbing as the Mod of the Year for ModDatabase, We thank you for your support! Also if you want to read the latest changelog check the comments. Woot! Great to hear its out. Curse you Soulfather, why did you release it now, when i have no internet at home :< ? wtf if u dont have internet how did u post that post ???? Evidently he ripped open a whole in the space-tame continuum. I wanted to paste the 4.2 changelog here but it is SO big, I would need 5 comments to post it a 2k words each. A clean version of the changelog can be found in your main kzmod folder, or take a look at the news on our main site: www.kzmod.com.. It's in the extended news of the release. Thanks and enjoy! Lovely, me and my friends are going to try it out.